From the first chapter the reader knows that Ignacio has left his wife. What Adela doesn’t know, on the night of this lecture, is her fate. She, who knows him better than any of his friends who saw the brilliant, successful man on the podium, knows things about him that others do not, knows the degree of artifice in his manner. But she doesn’t see the signs in the man sitting beside her in the taxi. The author uses free indirect style to shift between the thoughts of his characters and the narrator, sometimes with blunt precision. 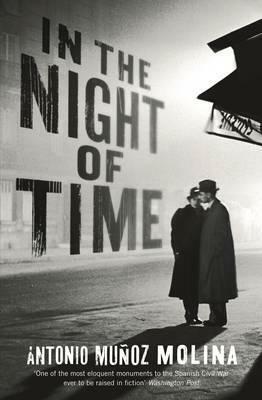 In the Night of Time, by Antonio Muñoz Molina, translated by Edith Grossman, Tuskar Rock Press, (an imprint of Profile Books) 2015. Review copy courtesy of Allen and Unwin. RRP $35 AUD. Thankyou for sharing, it sounds fascinating. Another one for the list. Orwell’s Homage to Catalonia one of my all-time favourites. i hope I would have gone too. At uni I wanted to study Spanish and go to Cuba but ended up doing a year of Arabic and staying home. Yes, I thought that was brilliant too. He probably shaped an entire generation’s attitude to the Spanish Civil War with that one book, but I am glad that now Spanish authors themselves are writing about it and the books are available to use through translation. Spanish is a lovely language, I only have tourist Spanish but I loved listening to it in the streets, the way Italian and French sound, like music!